I thought I would take a second try at the quad. Went there today since tomorrow looks like it might be rain. I actually got sun!! No rain only thing that was falling were the cherry blossoms! Glorious sketch! 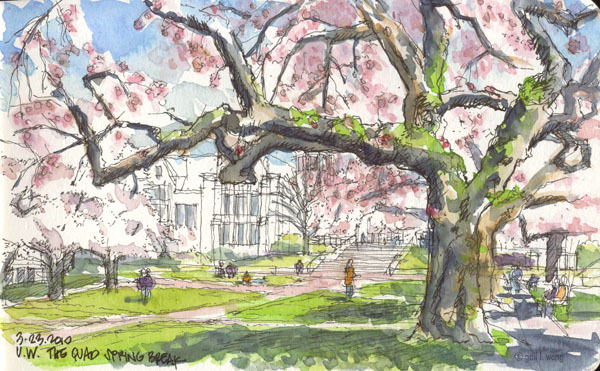 I've so enjoyed all the Seattle Urban Sketchers' pieces from your UW quad sketch crawl. This is a lovely sketch. I like the way the blossoms and branches frame the deeper perspective in the background. And the sunlight and shadows give it such a springtime feel. I was sad to miss last Sunday.